Every Sunday, I do all of my meal planning, grocery shopping, and cooking for the ENTIRE week. Although it’s a lot of work to do in one day, it makes my life as a single parent easier since I don’t have to worry about cooking for the rest of the week. It also saves me a ton of money, because I don’t eat out as much when I know there is food already made at home for me! I normally make a large serving of two different meals - one for lunches and one for dinners. Although some people don’t like eating the same thing every day for a week, I don’t mind at all! I will normally freeze half of whatever I’m making so it doesn’t go bad before the week is up. 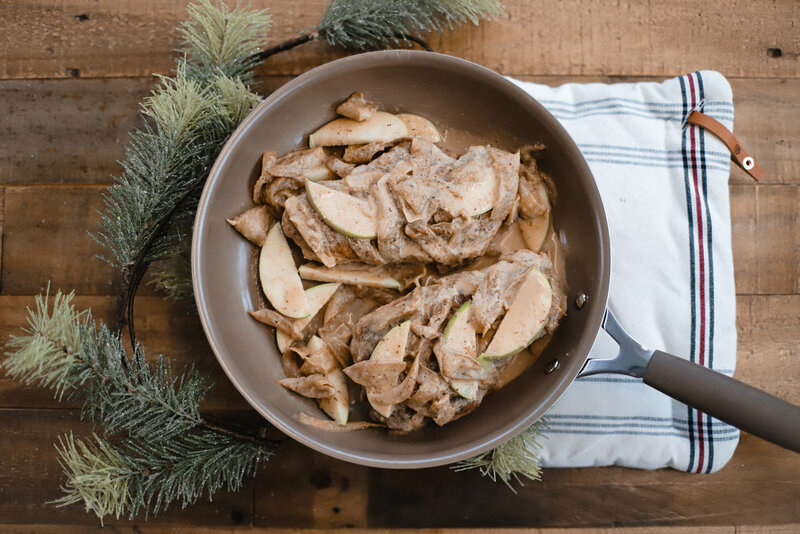 This week, I decided to make Apple Cinnamon Pork Chops using Hatfield® Premium Reserve Pork® Boneless Pork Chops. I always pick up meat at our local Lancaster Giant Carlisle Store Locations! Hatfield® Premium Reserve Pork® is my meat of choice because it is SO easy to cook and brings a steakhouse-quality experience at home! Hatfield uses their authentic brining and larding techniques to give you Premium Reserve Pork that is both flavorful and tender! It is the highest marbling grade versus all other premium pork, being all natural with no artificial ingredients. Hatfield is passionate about Pork With A Pledge™, which means they have elevated animal welfare standards when it comes to where they get their meat. I love Hatfield® Premium Reserve Pork® because is super easy to prepare and cook. You can cook it on the grill, skillet, or oven without overcooking it! With Hatfield® Premium Reserve Pork®, you can be confident that every cut is Tasty. Tender. Every Time.™ Keep reading for the recipe! 1. In a skillet over medium-high heat, melt half of the butter. Add pork chops and cook for 3 minutes per side, or until brown. Transfer to plate and set aside. 2. Return skillet to stove and melt the rest of butter. Add apples and onions and cook for 5 minutes, or until onion is translucent. 3. Add brown sugar and cinnamon to the pan. Stir in cream and apple cider. 4. Return pork chops to pan and cook for about 4 minutes per side, or until internal temperature reaches 160 degrees.